This is Part A — Handling BeautifulSoup and avoiding blocks. Make sure to check out Part B and Part C of this Web Scraping series. What is web scraping and when would you want to use it? The act of going through web pages and extracting selected text or images. An excellent tool for getting new data or enriching your current data. Usually the first step of a data science project which requires a lot of data. An alternative to API calls for data retrieval. Meaning, if you don’t have an API or if it’s limited in some way. Tracking and predicting the stock market’s prices by enriching the up to date stock prices with the latest news stories. These news stories may not be available from an API and therefore would need to be scraped from a news website. This is done by going through a web page and extracting text (or images) of interest. 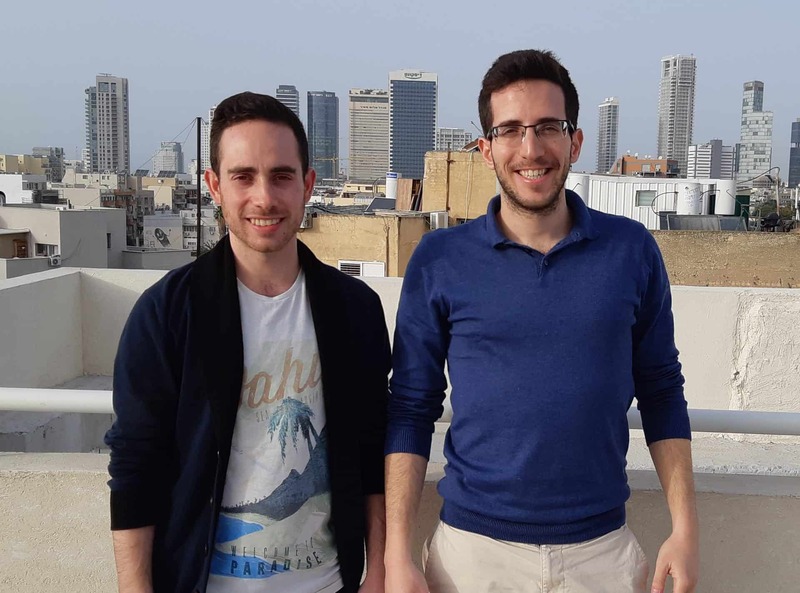 Our web scraping project was part of the Data Science fellows program at ITC (Israel Tech Challenge) which was designed to expose us to the real world problems a data scientist faces as well as to improve our coding skills. In this post, we show our main steps and challenges along the way. We have included code snippets and recommendations on how to create an end to end pipeline for web scraping. The code snippets we show here are not OOP (Object Oriented Programming) for the sake of simplicity, but we highly recommend to write OOP code in your web scraper implementation. In this project we were free to choose any website. The websites chosen by the rest of the cohort ranged from e-commerce to news websites showing the different applications of web scraping. 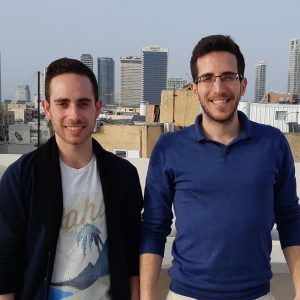 We chose a website for scientific articles because we thought it would be interesting to see what kind of data we could obtain and furthermore what insights we could gather as a result of this data. We have chosen to keep the website anonymous. In any case the goal of this post is to outline how to build a pipeline for any website of interest. First, one must inspect the website in order to determine which data one would like to scrape. It involves a basic understanding of the websites structure so that your code can scrape the data you want. In order to inspect the structure of the website, open the inspector of the web page, right click on the page → hit “Inspect element”. Then, locate the data you want to scrape and click on it. The highlighted part in the inspector pane shows the underlying HTML text of the webpage section of interest. The CSS class of the element is what BeautifulSoup will use to extract the data from the html. In the following screenshot one can see that the “keywords” section is what needs to be scraped. Using the inspector, one can locate the HTML element of the “keywords” section and its CSS class. 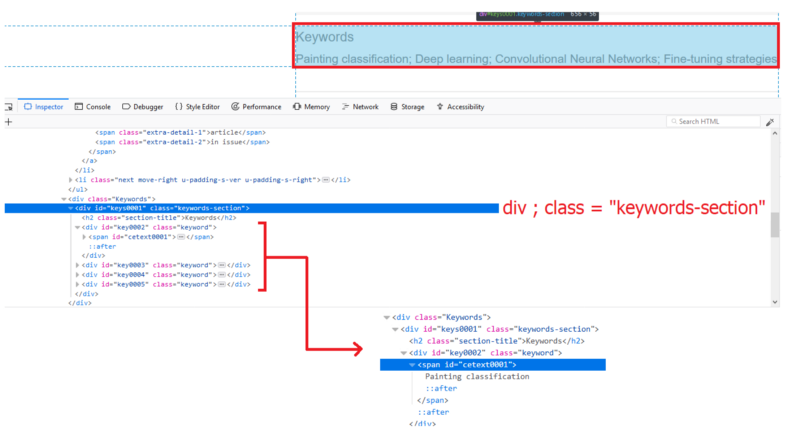 div (class=”keywords-section”) → div (class=“keyword”). From here, it’s pretty much the same. 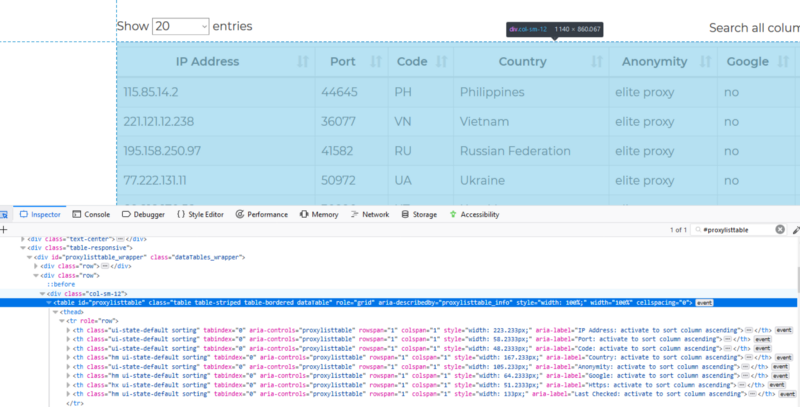 Locate the desired section, inspect the HTML element and get the data. Full documentation and much more examples of beautifulsoup can be found here (very friendly). In general, websites don’t like bot scrapers but they probably don’t prevent it completely because of the search engine bots that scrape websites in order to categorize them. There’s a robots exclusion standard that defines the website’s terms and conditions with bot crawlers, which is usually found in the robots.txt file of the website. For example, the robots.txt file of Wikipedia can be found here: https://en.wikipedia.org/robots.txt. # irresponsible, your access to the site may be blocked. How to deal with blocks? One way of doing this is by rotating through different proxies and user agents (headers) when making requests to the website. Also, it is important to be considerate in how often you make requests to the website to avoid being a ‘spammer’. Note — This is only for learning purposes. We do not encourage you to breach terms of any website. See below on how to implement this method in just a few simple steps. Implementing a proxy server can be done easily in Python. A list of free proxies can be found here (Note that free proxies are usually less stable and slower than paid ones. If you don’t find the free ones good enough for your needs, you may consider getting a paid service). Looking at the free proxies list, one can use BeautifulSoup in order to get the IP addresses and ports. The structure of the above-mentioned website can seen below. There are many HTTP headers that can be passed as part of a request when using the requests package in Python. We passed two header elements (which were sufficient for us), namely the Accept header (user permissions) and user agent (Pseudo-Browser). Create a dictionary object of “accepts” where each accept header is related to a specific browser (depending on the user agent). A list of accept headers can be found here. This list contains default values for each user-agent and can be changed. The following code shows an example of how to use the function we wrote before. We did not include the OOP code for the sake of simplicity. See Appendix for the full function random_header(). In this post we gave a brief introduction of web scraping, including when and why you should use it. We also spoke about more advanced web scraping techniques such as how to avoid being blocked by a website. In our next posts we are going to talk about data enrichment using API calls. This may not be as effective as it should be due to the limited speed of the free proxies but it is still worth trying. Note — In line 22 we saved a message into a logs file. It’s super important to have logs in your code! We suggest using logging package which is pretty simple to use.